"I can live with a "bad" sorta way" says Croc. He then pats Nomad twice on his back and he walks off. "Now then" says Croc with his attention back to Morrigan. "What kind of challenge do you have in mind"? Croc looks at Morrigan for a brief moment. In his mind, he knows that many of his dinosaurs are too much for Felecia to handle with some like Agro being too aggressive or Black Beauty being too massive and powerful. Plus, he feels a strange feeling inside of him, as if he doesn't want to hurt Morrigan's feelings or cause terrible injury to Felicia. But, this gives him an idea for what he can do. He reaches his large hand out and shakes Morrigan's hand saying "Alright, lets have a battle then". Croc then turns and walks away a bit before he yells out "Bindi"! For a moment, nothing happens...but then, a theropod dinosaur runs out from the foliage in front of Croc; a Liliensternus. Bindi approaches Croc and he pets her before he gets down on a knee and says to her with a whisper "You have a battle today, but I want you to go easy on this woman's dinosaur". "Can you do that for daddy" asks Croc. Bindi seems to understand Croc and she rubs her body against his chest. "Good girl, but make it look good now" says Croc. Bindi then walks around Croc, who gets up and turns, and Bindi hisses at Felicia. Morrigan looked on, "Hmhm, you know. Going easy on your opponent isn't very challenging for Felicia. She's...a special dinosaur in my eyes. But you'll see in the battle." she says as the Dilophosaurus looked on with what looked like a nod in agreement as if she understood her master. Croc looks at Morrigan then at Felecia before he says to Morrigan "If you want a challenging, then anyone of my pets are up for the challenge". "Perhaps you want another opponent instead of my little Bindi...perhaps Black Beauty or one of my abelisaurids; Agro or Genghis Khan" asks Croc to Morrigan. O.O "No no no. What I mean is you shouldn't let Bindi take it easy on my Felicia, meaning she should..... Oh nevermind. Bindi it is." -.- Morrigan says as she couldn't properlly explain this to Croc. Croc laughs and says to Morrigan "Well...I was gonna try to be a "gentlemen" for once to a young woman". "But if you want a challenge, then I guess I can let Bindi rampage like she has wanted to do for awhile now". Croc then looks at Bindi and says "Get her". Bindi then turns and looks at Felecia and growls, beginning to circle her. O.O "Hold up a minute." Morrigan says, looking around, "Isn't there an arena to do this battle at?" she asks. Felicia looks on as she sees Bindi circling her, lightlly hissing at her. "There is, but Bindi here is already hyped up and there is no time now" says Croc. "Begin the fight" he yells and Bindi quickly leaps at Felecia and knocks her over using her fore-clawed hands. She then yells at Felecia with a hissing scream and stands ready for Felecia's move. O.O "Woah-!" Morrigan says jumping out of the way as the fight began! Felica was knocked over & got a little mad. She got back up & roared at Bindi, flinging out it's frill & roars with a hiss that sounds like a mix of a rattlesnake & a howler monkey! The neck frill is certainly a surprise to Bindi and is a distraction. However, it doesn't distract her for long...she then turns her body sideways and quickly swings it the other way. With this, her tail collides with Felecia's head and the sound of the blow is heard as a whack. Bindi then backs away a bit, ready for Felecia's next action. Felica was hit on the head & growled. Then she bit down on Bindi's tail & shakes viollentlly. Bindi yells in pain and pulls her tail out of Felecia's jaws. She then turns to face her opponent with a screaming roar. Felicia looks on with her frill extended! Then she begins to use her secret weapon, she spits out what appears to be a black substance from her mouth at Bindi! Bindi leans back quickly, but the black substance hits her on her lower neck. She gives a shake of her head, seemingly disgusted by the substance, but she remains alert. She gives off a yell at Felecia, despite her surprising appearance and attack. But then, as the stand off is made, a louder and more powerful roar is heard not too far in the distance. Bindi leans down in a frightened state and cautiously looks around. O.O Felica also heard the roar & looks around for a bit, wondering what could make such a roar. O.O "What was that?" Morrigan asks, looking around as well. Croc looks to his right, hearing thundering footsteps coming ever closer toe the group. "She is coming" says Croc. The footsteps get louder and louder until a massive, black figure breaks through the tree line. 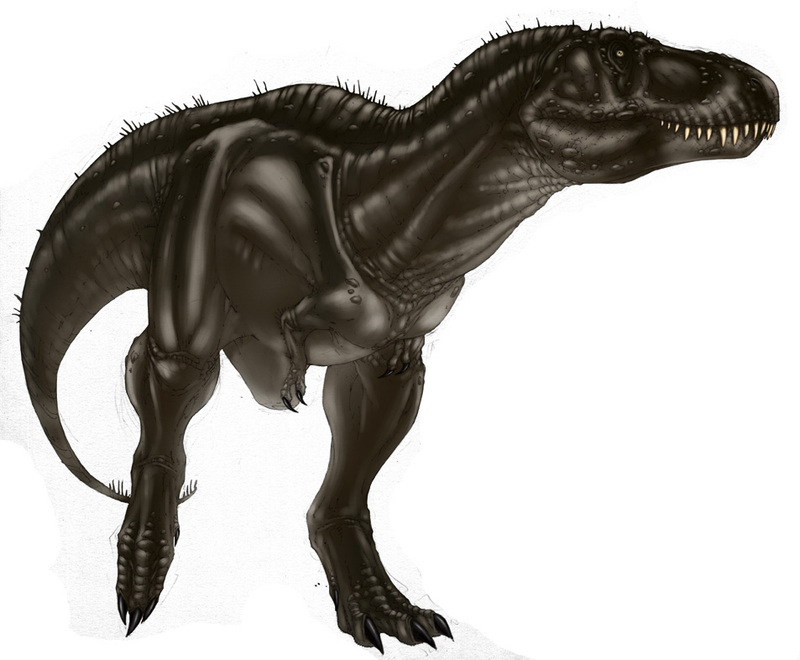 A loud roar announces the arrival of Killer Croc's largest and most powerful dinosaur; Black Beauty! Bindi, terrified by the giant theropod, runs away from her despite the fact that she lives in the same area as Black Beauty. Black Beauty looks down at Morrigan and Felecia, but only for a moment before she turns and looks at Croc. She leans her head down and sniffs him before she licks him with her tongue. "You came over here to see daddy did ya" says Croc petting the Tyrannosaur's head. "Yeah, she is my big girl" says Croc petting the Tyrannosaur's head. "Why don't you come over here and give her a pet or two" asks Croc. Black Beauty looks over at Morrigan with a stare of curiosity. Perhaps in her mind, she is thinking about what Morrigan will do. "Hm, ok." Morrigan says as she walked over to Black Beauty & began to pet her on the nose. Felica stayed where she was. Black Beauty seems to have some trust towards Morrigan despite her being a stranger to her. Unknowingly to both Morrigan and Black Beauty, Croc has wandered away from the two. Black Beauty turns and figures out that Croc has wandered off, but she knows where he has gone. She then leaves Morrigan and heads off to the left of Morrigan, disappearing into the forest and underbrush nearby. Morrigan looked on as she saw Black Beauty returning to the forest from whence she came. But when she saw that Croc was also gone, she looked around, o.O "Hm. onder where he went?" she says to herself as Felica looked around with her. As Morrigan searches for Croc, Agro walks out from the undergrowth and into her view. Agro turns his head, spotting her and Felecia...he is like a guard dog in Croc's environment only he is much more dangerous than any guard dog. He snarls loudly, saliva dripping from his jaws, and he turns his body towards Morrigan and Felecia. O.O Both Felicia & Morrigan were suprised to see Agro coming out of the bushes & growled at them in a protective way. "Ummm....h-h-hello." <8 ) Morrigan says as she & Felicia slowlly began to back away from the theropod, "N-now calm down, we're not going to hurt you." she says again. Agro doesn't calm down and starts to scrap his clawed foot on the ground. He growls and arches his back before releasing a powerful roar. Agro is a hyper aggressive carnivore that will never back down from a fight or a chance to tear something apart. Unfortunately for Morrigan and Felecia, they just happen to be his targets of interest.